While Oppo was rejoicing the launch of Oppo R5 that was the praised for being the world’s slimmest smartphone measuring 4.85 mm, Vivo started making news. Well, the fellow Chinese manufacturer came up with teases claiming that it is prepping the thinnest smartphone that will carry a very slim profile measuring only 4.75 mm. Now, the Vivo X5 Max is released in the Indian market for Rs 32,980, while the Oppo R5 is set to make its entry into the country by the end of this month. Here we come up with a detailed comparison between these smartphones to know which one is better. The Vivo X5 Max is bestowed with a 5.5 inch display carrying a full HD screen resolution that results in a pixel density of 401 pixels per inch. On the other hand, the Oppo R5 has a 5.2 Inch display with 1920×1080 full HD resolution and 423 ppi pixel density. While the Oppo offering comes equipped with Gorilla Glass 3 protection to prevent the screen from everyday damage, the Vivo smartphone lacks one. As both the smartphones are thin, they use Super AMOLED panels instead of IPS LCD panels. Comparatively, the Oppo smarphone has a better display with increased pixel count and protection, though there would be no major difference in terms of usability. Both the smartphones use a 64 bit octa core Snapdragon 615 chipset from Qualcomm paired with 2 GB RAM. With similar hardware we cannot expect the two smartphones to differ too much in terms of performance. Notably, the chipset’s big.LITTLE architecture is believed to enhance the battery life of the device and to render a great performance. Both smartphones come with 13 MP primary shooters that are companied with f/2.0 aperture and LED flash for better low light snaps. Also, they are given front facing 5 MP selfies cameras to handle the video conferencing and self portrait departments with ease. Notably, the former supports capturing 2160p videos, while the latter has a wider f/2.4 aperture front facer for wider selfies. The major difference between the two phones lies in this segment. Both are bundled with 16 GB of native storage capacities, but the Oppo R5 misses out on an expandable micro SD card slot for its slim build, whereas the Vivo X5 Max supports additional storage up to 128 GB despite being slimmer. Both Oppo R5 and Vivo X5 Max make use of a 2,000 mAh battery, but the former takes advantage of its VOOC Rapid charging technology that will charge it from 0 to 75 in just 30 minutes. On the other hand, the Vivo smartphone does not use any such technology and falls short of its challenger in this department. Oppo R5 runs on Android 4.4.2 Kitkat with Color OS, whereas the Vivo X5 Max is based on a customized version of Android 4.4.4 KitKat. Connectivity wise, both the smartphones come with usual aspects such as 4G LTE, 3G, Wi-Fi, Bluetooth and others. Notably, Oppo R5 misses out on a 3.5 mm audio jack that is present on the Vivo smartphone that is relatively thinner. When it comes to pricing, Oppo has announced that the smartphone will be priced between Rs 25,000 and Rs 30,000, but the Vivo offering is relatively expensive costing Rs 32,980. 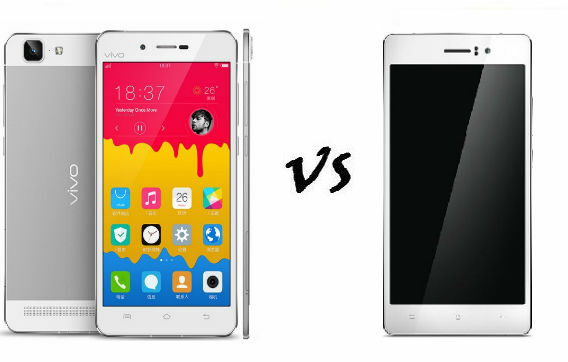 But, Vivo X5 Max is relatively thinner than the Oppo R5 and is better as well. The significant differences that make the Vivo smartphone a better one in terms of competition are the inclusion of micro SD card slot for expandable storage support and a 3.5 mm audio jack. The only downside of the device is the lack of a fast charging tech that could charge the device faster as it comes with an average battery.